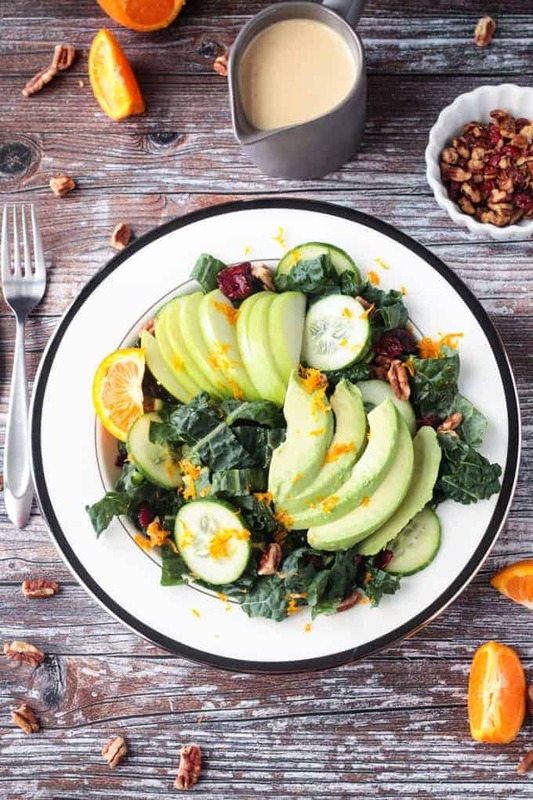 Lacinato Kale Superfood Salad – with avocado, apples, cucumbers, pecans, and a creamy citrus tahini dressing. A delicious, nutritious stand alone salad or perfect as a side dish for meals or even holiday menus. 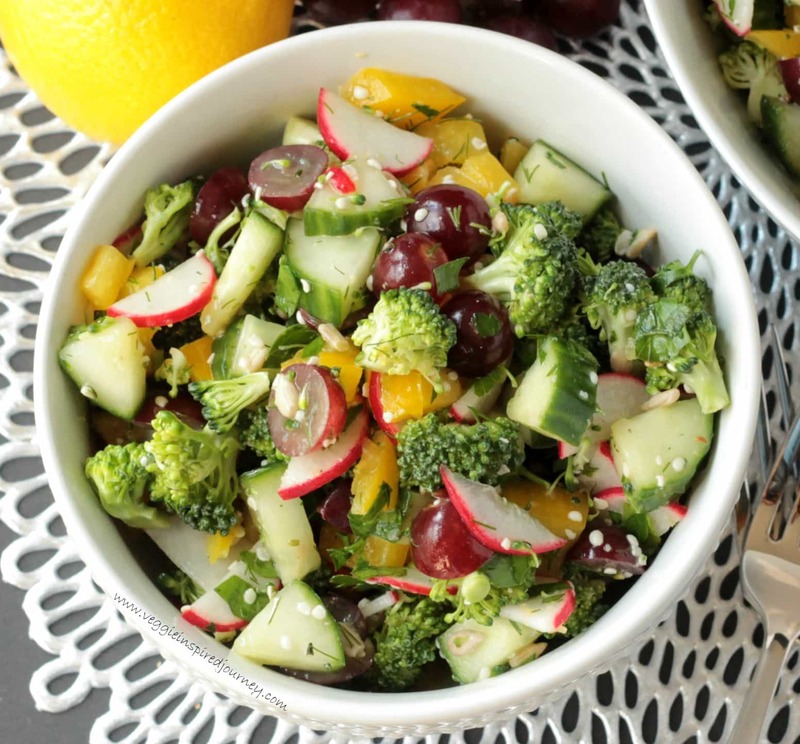 The weather has turned cooler and all of a sudden I’m craving….salad. I know, I know – you expected me to say soup. Truth is, I’m always craving soup. But I’m not always craving salad. We eat a lot of traditional green salads with romaine, tomatoes, and cucumbers, but I don’t always go out of my way to create a fancier salad. The last few weeks, though, I’ve really had a taste for loaded leafy green salads with delicious dressings. They’re so easy to throw together for lunch. 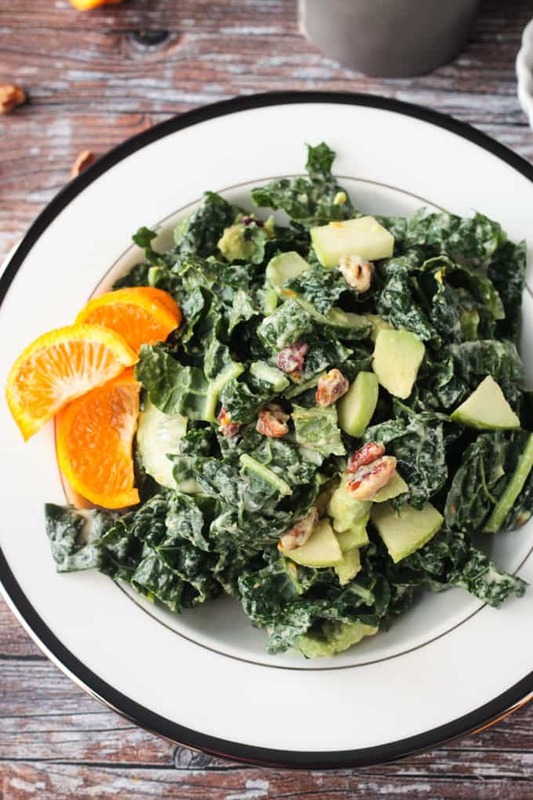 This Lacinato Kale Superfood Salad has been a favorite – filling and nutritious. Bonus – kale is a sturdy green that can handle hanging out in salad dressing without getting wilted. So, make a big bowl, store leftovers in the fridge, and enjoy it all week! 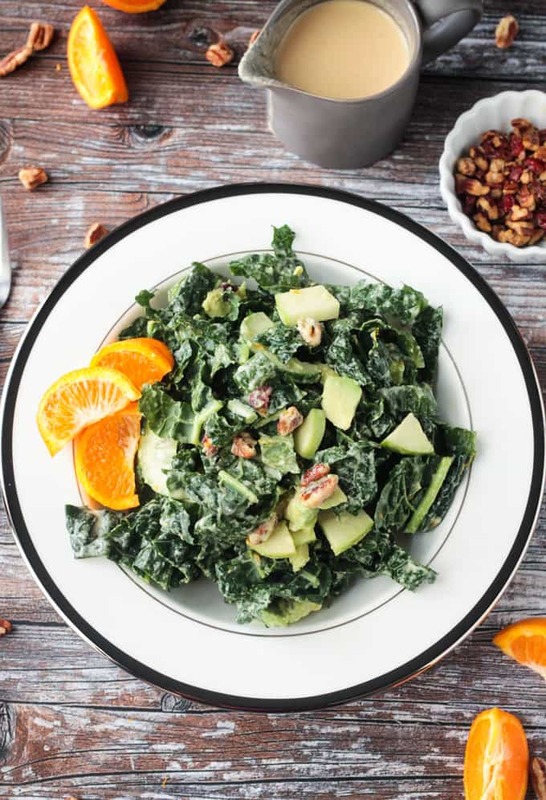 I paired this hearty kale salad with my creamy Citrus Tahini Dressing. I love the sweetness of the oranges paired with the bitterness of the tahini. Apple cider vinegar adds some tang. If you like a sweeter salad dressing, a tablespoon of pure maple syrup whisked in would be wonderful. Lacinato Kale: Also called Tuscan, Dinosaur, or Black kale, it’s leaves are long, dark, and wrinkly. Kale is a cruciferous vegetable (like broccoli, cauliflower, and cabbage) and is one of the most nutrient dense foods you can find. Super high in many vitamins and minerals (like A, K, C, B6, calcium, and potassium), kale also contains anti-oxidants, can help lower blood pressure, and may have protective effects against cancer. Avocado: High in heart healthy fats, this creamy green fruit also contains lots of fiber, vitamin K, folate, vitamin E, potassium, vitamin C, and more. Apple: “An apple a day, keeps the doctor away.” High in fiber and vitamin C, apples may help you regulate blood sugar. Cucumbers: An incredible veggie for hydration, cucumbers also have anti-inflammatory properties. Pecans: Satisfying and high in a numerous amount of vitamins, minerals, and protein, pecans also boast heart healthy fats and anti-oxidants. This superfood salad is satisfying enough to enjoy as an entrée, which I’ve been doing for lunches quite a bit. It will serve two a main dish. If you want to stretch it further, it will serve 4 or 5 as a side to a meal. And I think it would look gorgeous on the holiday table, too. I hope you enjoy this Lacinato Kale Superfood Salad as much as I do. If you try it, please come back and leave me a comment below with your feedback and rating. You can also find me on social media. Be sure to tag @veggie_inspired and #veggieinspired so I’m sure to see it. Enjoy! 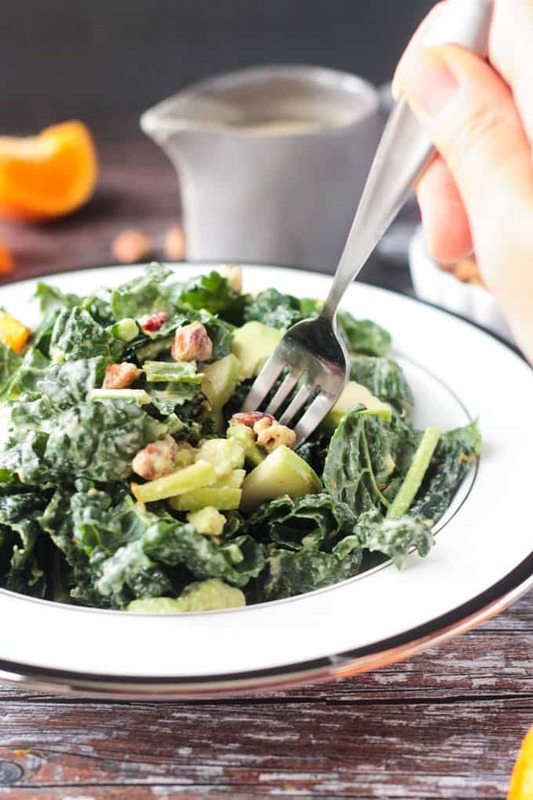 Lacinato Kale Superfood Salad - with avocado, apples, cucumbers, pecans, and a creamy citrus tahini dressing. A delicious, nutritious stand alone salad or perfect as a side dish for meals or even holiday menus. 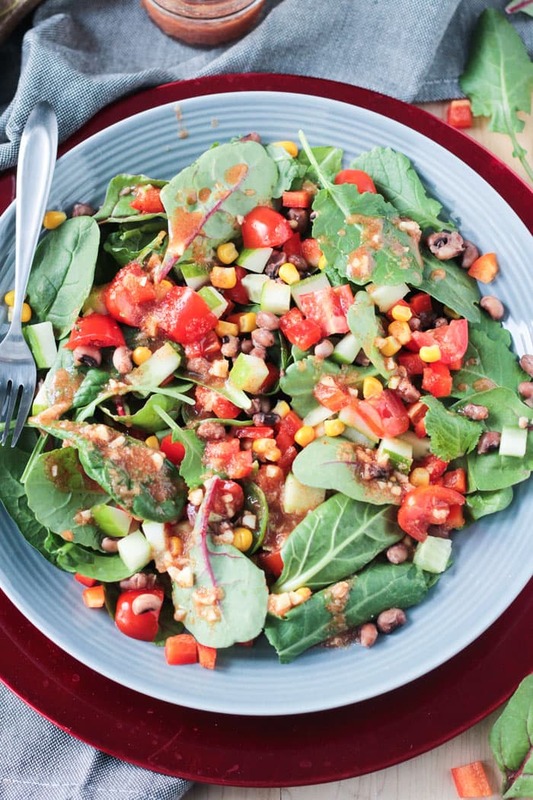 Add all salad ingredients to a large bowl, pour on the dressing, and mix well. *To toast pecans: Heat a small skillet over medium heat. Add the pecans and cook until they start to turn just a tad darker and you can smell them toasting, about 4-5 minutes. Continually shake the pan or stir the nuts around so they don't burn. Don't walk away from the skillet - nuts can burn quickly!! Once toasted, transfer to a plate in a single layer to cool. Your salads are simply delightful! Even my omni family and friends, who would never eat anything remotely healthy, love them. The salad dressings are simply the best! Thank you Sue Ellen! That is so nice to hear! 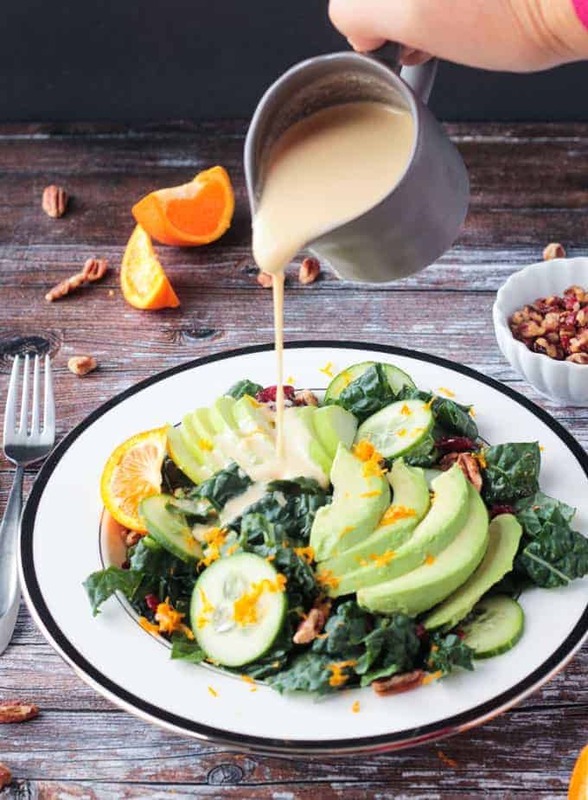 This Citrus Tahini Dressing is definitely one of my faves. Enjoy your weekend! Thanks for sharing such a delicious salad. Actually, I was searching for some yummy side dish ideas for the upcoming holidays and here it is! Just bookmarked your site. Thanks again for the dish– you really made my day! Awesome. Thank you so much, Donna! Please report back if you try it. I completely agree that one of the best parts of kale is that you can make a huge salad and pull from it day after day. It doesn’t wilt & brown like lighter greens. Your citrus dressing sounds so bright & lovely! I always pair tahini with lemon, and so I like that you branched outside of my norms. Thanks, Cadry! Let me know if you try the dressing – I think you’ll love it! Dinosaur kale is my favorite! It’s gotten colder here too but I’m still in the mood for salad. This looks delicious! Everything about this looks incredible, especially that orange tahini dressing! Can’t wait to try this. Thanks, Sarah! I hope you love it! I love these flavors! This is my kind of salad! Love the colors on this! Perfect salad for fall season. I love a little fruit in my salad, I think the sweetness will go well with the kale and Citrus Tahini Dressing, looks fantastic! Thanks for sharing this recipe! Glad you like it. I love fruit in my salads too. A little sweetness the natural way! Thanks, Tina! That dressing and salad sound amazing! Makes me want to devour the whole bowl for dinner! Love the ingredients on this salad. I feel healthier just looking at it and can’t wait to give it a try! If only we COULD become healthier just by looking! 🙂 Thanks, Kathi! What a lovely salad! Love the combination of ingredients and that citrus tahini is so smart. I’m really looking forward to making this.